Hitler wasted little time in securing control over the Christian churches in Germany: within six months of taking power he began to put the screws to the Protestant churches. This article devotes much column space to the pastors who had no problem with any of Hitler's commands. "The issue, then, is broader than the Reich. Jews, Protestants and Catholics the world over have seen another scrap of paper torn up in Hitler's repudiation of his pledge on taking office that the Nazi regime would respect the freedom and legal rights of German churches... Hitler modified an order requiring all Protestant pastors on a recent Sunday to display Nazi banners from their church spires.... The Nazis have also suppressed the German branch of International Bible Students' Society, outlawed the Boy Scouts, and, to make their program more effective - given a Nazi cast to the Lord's Prayer." Here is one of the earliest reports from Hitler's Germany on the the Nazi hierarchy butting-heads with the Christian churches. As the fascists forced the Catholic and Protestant clergies to coerce, the churches reminded the new government of the autonomy they have always enjoyed (more or less). "As for anti-religious communism, said Doctor Charles S. Cleland, 'In our missionary circles this is more to be feared than nationalism. The latter may be, and oftentimes is, a patriotic movement, while the former aims only at destruction. Communism of the type now referred to seeks not only the suppression of Christianity, but of all religions. Its purpose is to make governments entirely secular, and to free the national life from all forms of faith and worship." "As pastor of the little Austrian church, the good father was happy until Nazis swallowed the country, mistreated his Jewish converts and threw many of his colleagues into the dreaded concentration camp of Dachau. Shocked, he attempted to preserve a fragmentary picture of events for posterity - and found himself in Dachau. 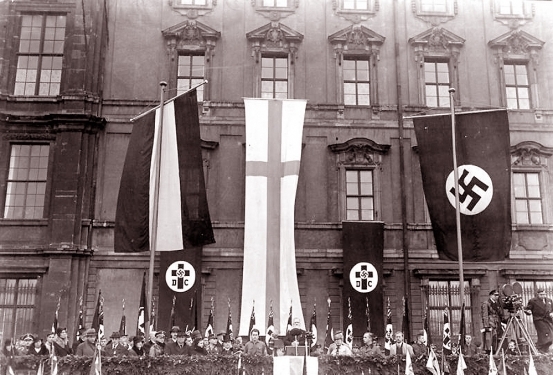 Similar episodes, which are today common throughout Nazidom, only succeed in stiffening the Catholic fight against Nazism." "Now Niem�ller is resisting the attack of the German Christian Party, a neopaganistic movement, on the old Protestant faith, in fact. He was not molested when he read to his congregation the manifesto of the Confessional Synod' Brotherhood Council. "All most know that there is a bitter propaganda campaign against the Church under way. We must fight against this and for active, not passive, Christianity." "With every organization in Germany gobbled up, the Evangelical and Roman Catholic churches continue their valiant, tortured struggle against absorption in the totalitarian state." "Last week Michael Cardinal von Faulhaber (1869 - 1952), Archbishop of Munich, mounted the pulpit of old St. Michael's and basted Nazi violations of the Concordat, the 1933 treaty between the Reich and the Vatican under which Catholics agreed to a ban on the political activities clergy and lay leaders, in exchange for religious liberty in their churches and schools."